New Fire code requires detectors on each level of your home. Must also have alarm outside all sleeping areas as well. Last year in Ontario, four house fires caused 17 deaths - 11 of them children under 16, two of them seniors. Smoke alarms were a factor in all of them, says Bernard Moyle, Ontario's Fire Marshall. and 48 per cent of those fires were preventable, he says. 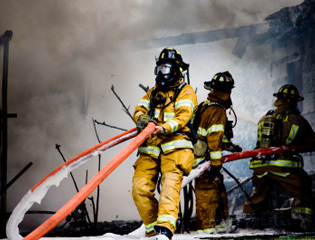 "Smoke alarms double the chance of escaping fires. Thats why we are taking a new approach now." This new approach, called " Smoke Alarms: It's the Law," is a fire code that took effect March 1. It requires residents to have working smoke alarms on every level of their home. Tesla Fire Systems stocks a myriad of fire alarms, carbon monoxide detectors, fire extinguishers and exit and emergency lighting, among other fire protection products, to protect your home and business. To check out our fire products, click here. We also provide install, repair and inspect fire systems in residential and commercial settings. To learn more about out services, click here. Tesla Electric is also experienced in removing and replacing knob-and-tube wiring to ensure your home is safe. To learn more about knob-and-tube and what you need to do to protect yourself, click here. Watch the above video to see the awesome power of a Explosion in Toronto Last year.